The categories are immediately removed and everything becomes sorted by the first character of each preference pane. This also condenses the prefs into a smaller screen space, reminiscent of older versions of Mac OS and Windows. This isn’t easier for everyone, but for someone new to Mac OS X who is used to the alphabetical grouping of Windows control panels, it can make it much quicker to get where they need to go. 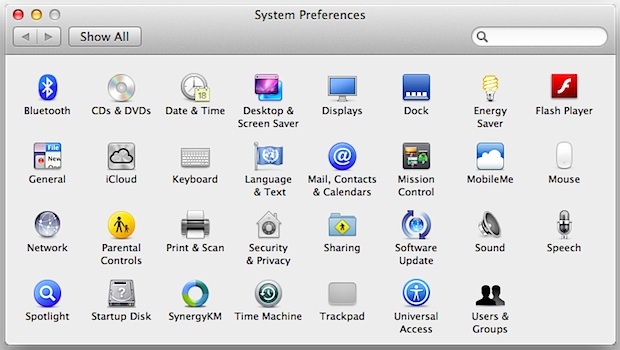 I’m use to the way the Preferences are grouped since using Macs since 07. No use breaking something that works. Also you can click customize and un-check the ones you never use. Nice tip. When I have to tell someone how to find a panel, I send them to the search field at top right of the window.